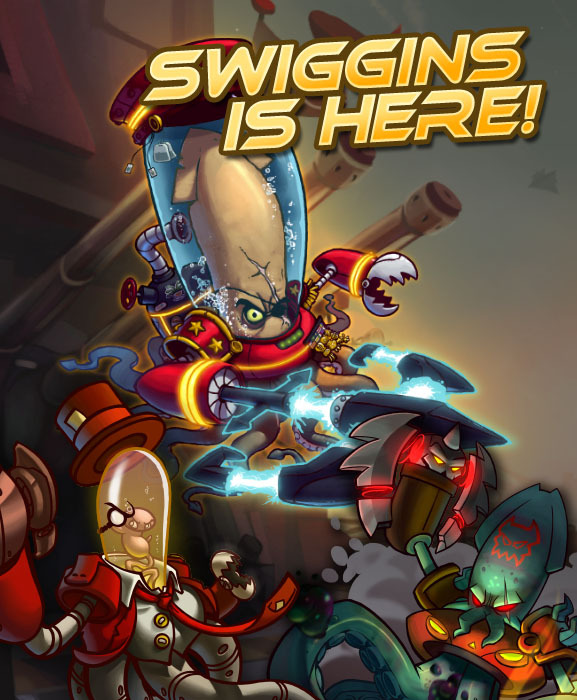 The 2D MOBA Awesomenauts adds its 15th character: Admiral Swiggins! The Admiral is the first character to be completely designed by the player community. The base character and his abilities were first picked out through a game design contest. For the resulting character a second contest was held to determine the visual design. All of this resulted in an awesome tea-loving Admiral of the Royal Space navy, who is also a Squid. He wields a powerful anchor that allows him to both pull himself towards enemies and anchor his enemies onto the level. 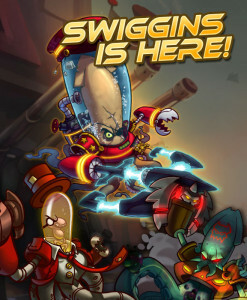 Admiral Swiggins will also be in the upcoming PlayStation 4 version of Awesomenauts. The Admiral also has two notable skins: firstly a Swiggins coming from a deeper place, the Cthulhu inspired Abyssal Swiggins. And secondly a more villainous Swiggins called Swiggins, PHD, but better known as Dr. Fetus. In addition to releasing Swiggins, Ronimo has some news regarding their Starstorm Kickstarter effort. All backers will also receive a copy of their previous game Swords & Soldiers HD plus its expansion on Steam. The 2D RTS laid a lot of groundwork for Awesomenauts in it’s game design, artwork and engine code. Owning Swords & Soldiers HD also unlocks the Necro Voltar skin inside Awesomenauts, adding a grim twist to the mostly friendly healer. Finally, Ronimo has teamed up with the Humble Bundle folks to create their own mirror of the Starstorm Kickstarter page! The Humble team provides widgets that allows fans to make an easy and safe purchase. Backers will all receive a personalized rewards page where their rewards will be made available as soon as they’re ready.